I have started planting my flowerpots. 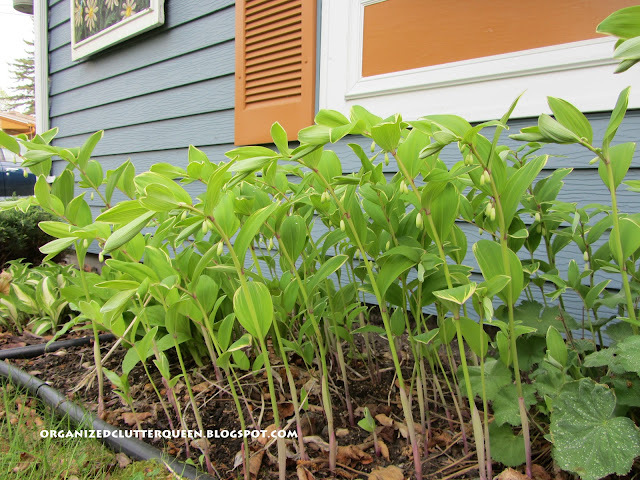 We still have a threat of frost almost up to June 1st here in Northern Minnesota (and sometimes even after that). I always try to push it though, and end up having to cover and carry in plants! 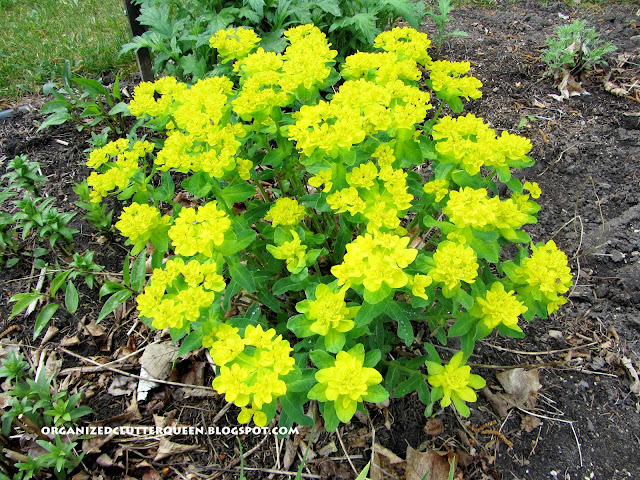 Not much is blooming here in the perennial border. 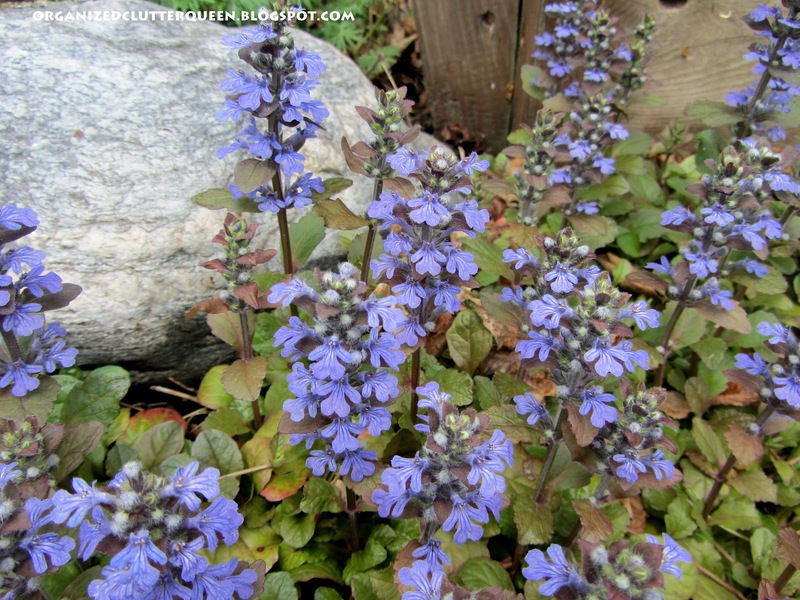 My creeping phlox and forget me nots are not very lush this year but they are blooming. I purchased a chicken feeder at an antiques store for $13.50. 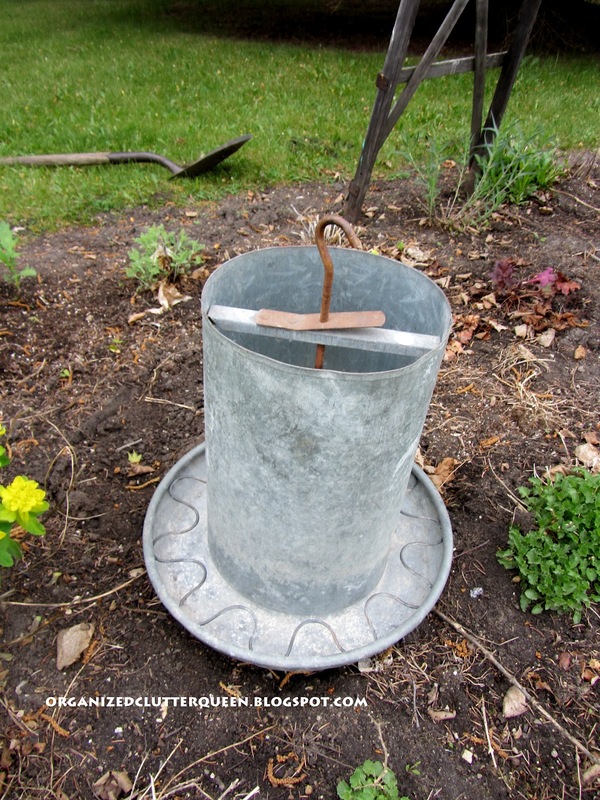 I love planting in galvanized pails and tubs too. 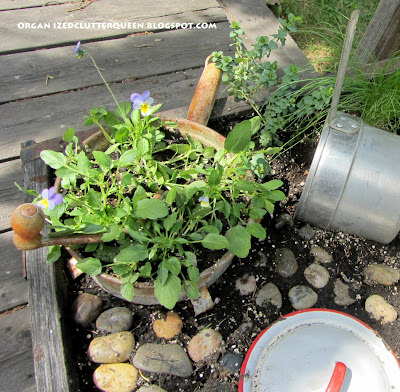 I think I will put a larger trailing plant in the top and more hens and chicks in the tray. 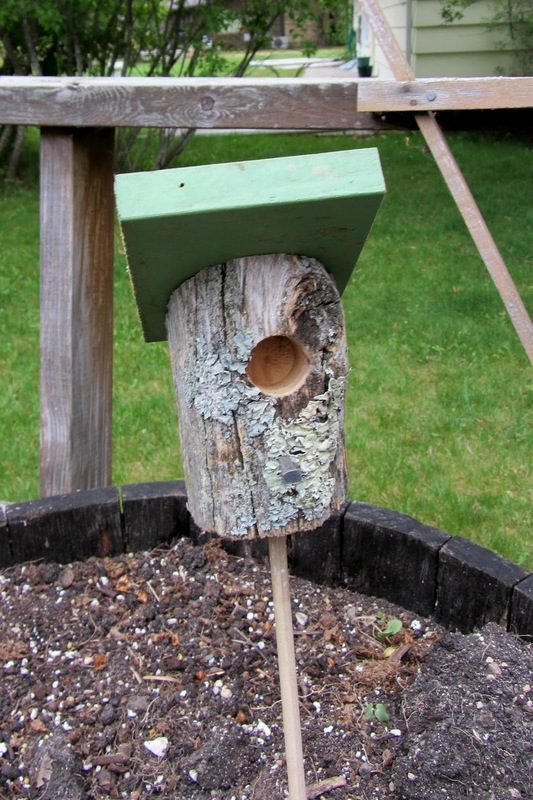 I bought this rustic little bird house at our church's Pie and Perennial Sale yesterday. Also from the church's sale, a rustic bird house plant pick complete with lichens. 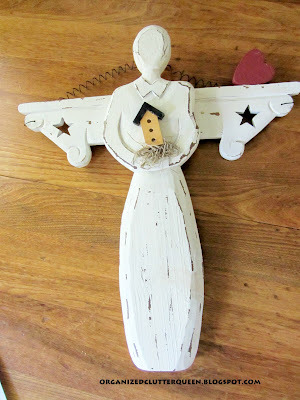 Do you remember this garden angel from one of my previous thrifty shopping posts? I "de-cute-sified" her a little. 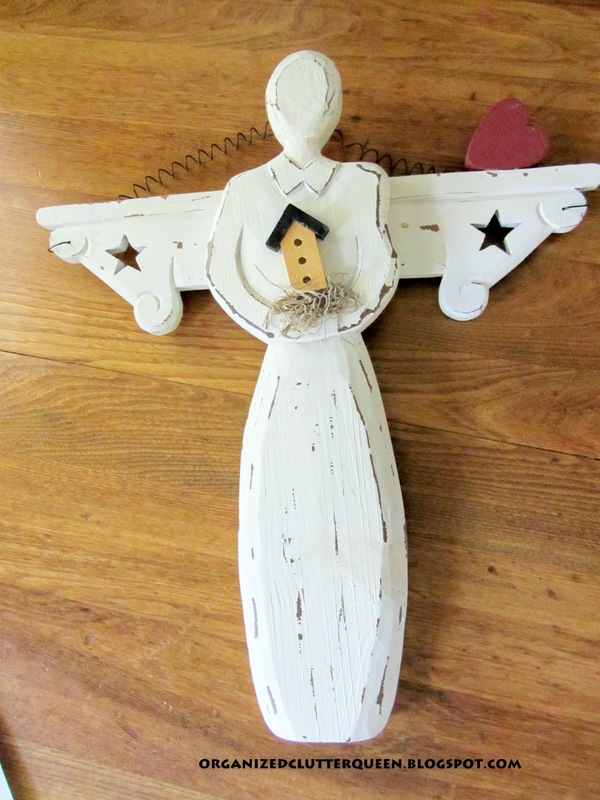 The heart on her wing is gone and so is the birdhouse. 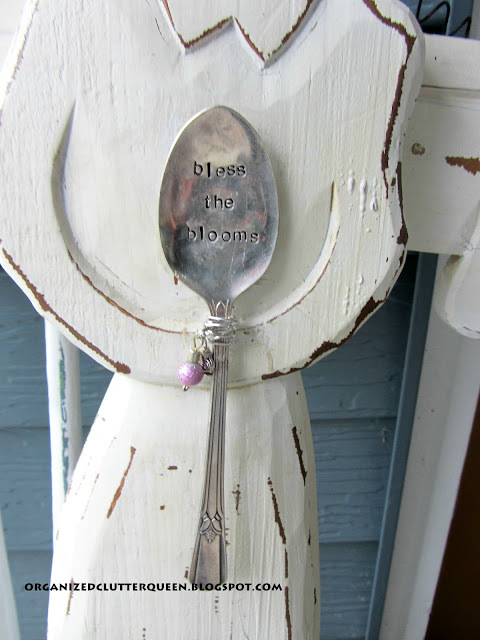 I added an engraved spoon with "Bless the Blooms". Much better! Lastly, no fairies at the kitchen fairy garden yet, but the squirrels have visited quite a few times and chewed down the moonbeam viola! Not a blossom is left! Enjoy your day! Hope you can spend at least part of it "outdoors". On no the squirrels. They must not like what I planted. Not sure they can get to my fairy garden in a box. Your house is painted the same color as mine. We used to have burgundy shutters and now they are like a milk chocolate color. 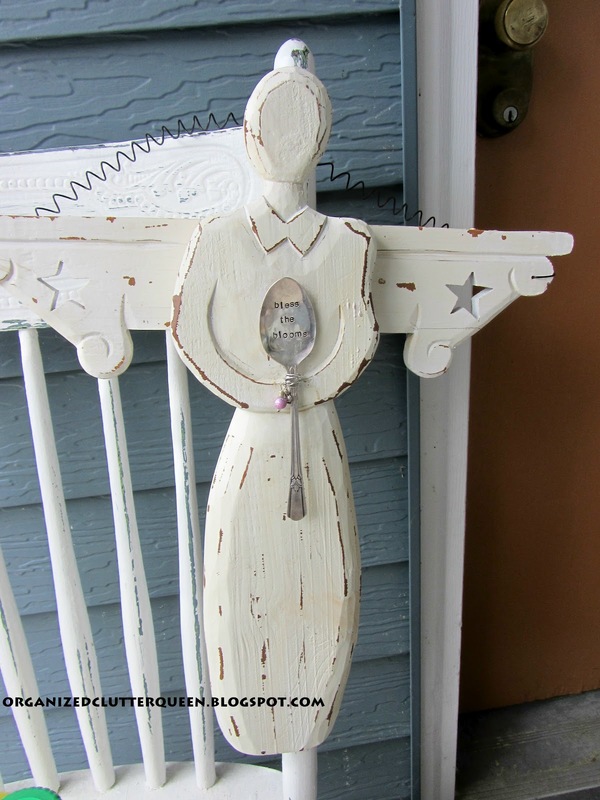 I love love love the angel with the spoon. Bless the blooms! I love it. 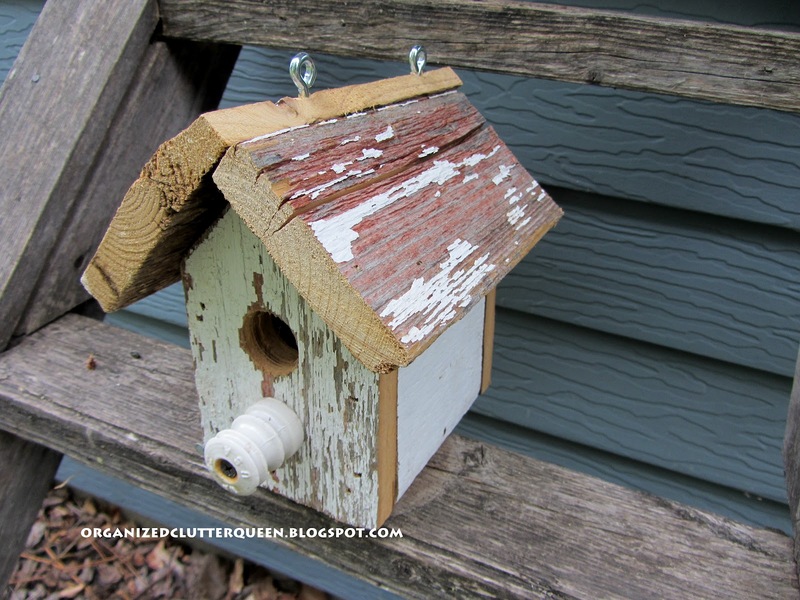 The birdhouses are rustic loveliness at its best. Oh...sorry about the viola...maybe plant something they don't like? I didn't know you lived in Northern Minnesota! Awesome...I love Minnesota and traveled through many times on my way to Canada. I lived in Iowa for many years and Northern Illinois and I need to go back. The heat is too much for me in the South! Although I must admit this Spring has been beautiful and so far little humidity...that makes ALL the difference! There's truth to that saying about a dry heat. With high humidity you can barely breathe. But I miss the snow too now that I'm retired and don't have to commute in it. I loved nothing better than a good snowstorm or blizzard as long as no one got hurt and I was safe and cozy at home. Those flowers are so pretty and those first 2 I'd never heard of. I love the term "de-cutesifying"...so true! I never cared for most of that "cutsey" stuff but I like your angel now! I have a couple items that were given to me that could use that treatment! LOL! Ha! I think those darn squirrels are taking over!!! You've got some pretty perennials coming up. My bleeding heart is still just a few inches high and covering only a fraction of the space it usually does. The lack of snow cover really did a number on it. I love the ajuga! The color is beautiful! Carlene, it's going to be 37 tonight? I wish it would be 37 tonight here. It was a beautiful day, however, and because of that I got a lot done all afternoon after church, so I can't complain. Thanks for stopping by Quirky Vistas and leaving me a comment. Much appreciated! Such great finds! Love the angel- sorry about the dang squirrels! Hi Carlene! I really enjoyed seeing all your great finds. We are snow birds nearby in Hayward Wisconsin Lakes area. Hi Carlene, darn those little critters. I sure hope they don't eat the fairies when you do put osme in the garden. lol! I like your rustic finds. The spoon in the angels hands is so sweet. Good find on the feeder. Can't wait to see it planted. I didn't make holes in the bottom of mine. It's sitting up where it won't get a ton of water. If you are sitting in a bed where sprinklers hit I probably would. 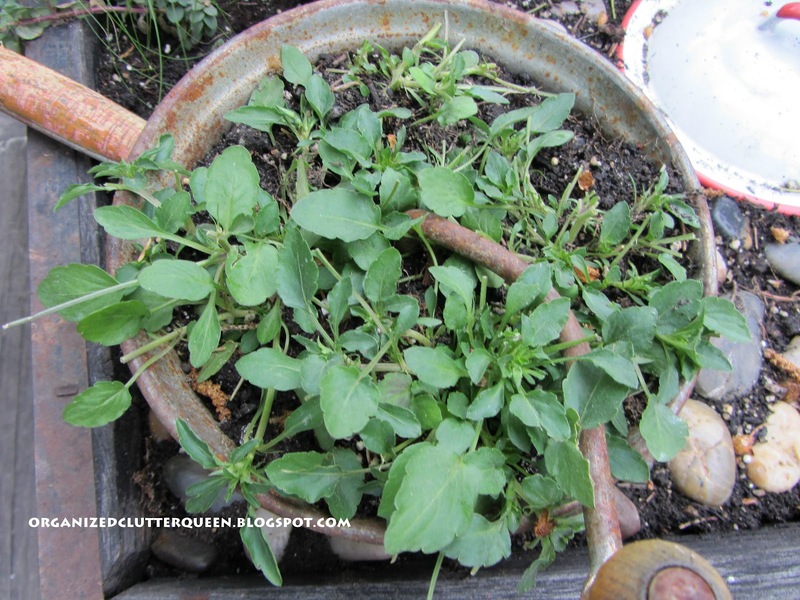 You can also add a thin layer of tiny rocks before dirt. That way you will get some drainage. Thanks for sharing with Share Your Cup! Lovely finds! I am in Northern Minnesota too and was wondering where you were located? It is surely going to be chilly for the next little while, isn't it?